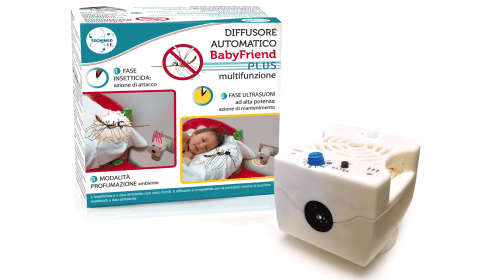 Baby Friend Plus is an anti-mosquitoes device which uses, in different phases, two different technologies in order to protect you from mosquitoes in an effective and safe way. At starting, Baby Friend Plus emanates insecticide (liquid or plate according your preference) for the pre-set time. As the preset time runs off, the device automatically turns in high power ultrasounds diffuser. Ultrasounds are able to keep under control mosquitoes which should enter in the room later, as ultrasounds stun and confuse mosquitoes. The complete cycle lasts 24 hours, and it is repeated every 24 hours after the first activation. In addition, the device can work as airfreshener using a perfume instead of insecticide. fasten the small bottle containing insecticide liquid on the base of the diffuser, or insert the insecticide plate in the apposite place (insecticide liquid and plate are not included in the packaging). Insert the device into the socket and turn the switch on. The RED control light will turn on. As the preset time runs off, the device automatically turns in ultrasounds diffuser and the YELLOW control light will turn on until the 24-hours cycle is completed. 24 hours after the first activation, the cycle will re-start automatically. If necessary, you may activate an extra-cycle of 20 minutes, pressing the BLACK button. After this lapse, the device will resume its normal cycle. fasten the small bottle containing air freshener on the base of the diffuser and adjust the intensity of the perfume by rotating the ferrule. 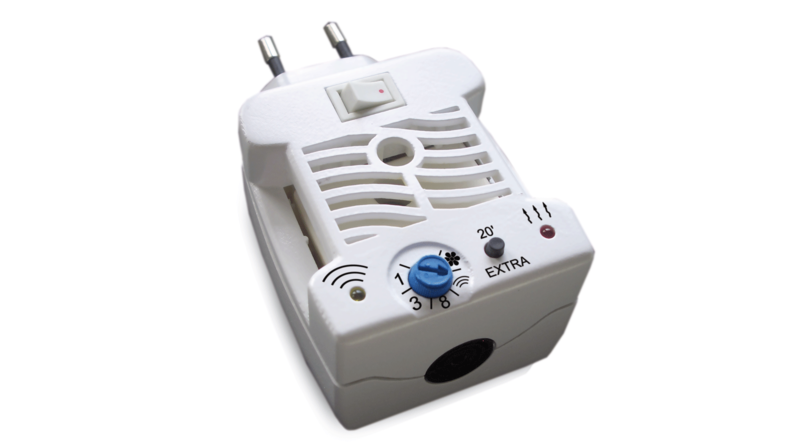 Set the preferred mode using the selector (FLOWER), insert the device into the socket and turn the switch on. The RED control light will turn on. – verify that the plug is not covered by furniture or curtains. If they are, choose plugs placed preferably at 1 m from the floor. – Carpets, fabric wallpapers or thick curtains can absorb a part of the ultrasounds, thus reducing the device’s efficacy and operative area. – Ultrasounds are not advisable for pacemaker carriers, as in some cases they can affect pacemakers’ pulses. Baby Friend Plus’ ultrasounds may be perceived by pets, especially big-size dogs, which may be disturbed.